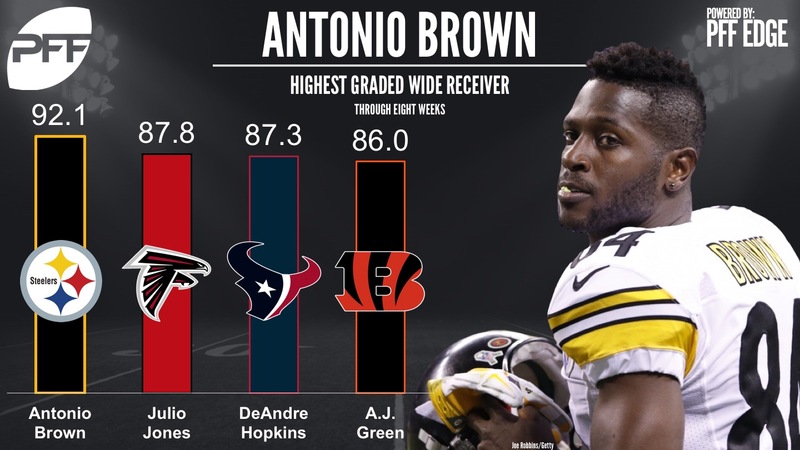 With the midpoint of the season approaching, it’s time to run the PFF analytics on what the rest of the season will look like. Using our PFF data we are going to project wins for every NFL team with input from the grading as well as strength of schedule going forward. These wins are rooted heavily in our data that produces the PFFELO rankings each week, and has proven to have a very strong indicator to win probability. So here is where we have every team projected by the end of the season. In a shock to nobody, the PFF analytics still project the Patriots to comfortably claim the division and end the season right around their Belichick-Brady era baseline of 12 wins. The Patriots have begun to get a handle on some of their busted plays that cost them early this season and have been quietly racking up the wins even as they haven’t been convincing. The Bills are 5-2 right now and 4-1 over their past five games, and while getting to 10 wins would be doubling their win total, it would see them lose twice the number of games down the stretch as they have lost to date. This is still a team in flux, as their multiple moves around the trade deadline shows. The Dolphins season is an unusual one, as they just shipped out Jay Ajayi – by far their best offensive weapon – having already lost Jay Cutler to injury. The defense has been quietly effective, if flawed, and it will need to carry the team down the stretch as their strength of schedule only gets tougher. Despite being the surprise of the season, the analytics projects the Jets to only match what they have done so far this season down the stretch and end the season 6-10, which might not do the season they have had justice if they continue to play unexpectedly well in the second half of the season and yet continue to lose close games. The Jaguars have a winning record so far, and the projection is for that to continue, with a punishing ground game and a defense that is only getting tougher with the addition of Marcel Dareus. The Jaguars defense has combined for 144 total pressures over the first half of the season, and the secondary boasts the league’s best cornerback tandem. The Titans are also benefitting from one of the league’s easier strength of schedules, and like Jacksonville, it only gets easier from this point on. Tennessee currently owns the tiebreaker with the Jaguars atop the AFC South, and the analytics projects the two to be very close at the top of the division by the end of the season. Houston could be a team to really surprise over the second half of the season, especially if rookie QB Deshaun Watson continues to excel. They have had the 15th-toughest strength of schedule so far, but that becomes 30th over the remainder of the season. While the rest of the AFC South benefits largely from their schedule getting easier down the stretch, the Colts see theirs get much tougher, and they only have two wins to date with one of the league’s easiest schedules. It may become a pretty tough back end of the season for Colts fans who may want to start checking out draft prospects. The Steelers haven’t been the unstoppable force on offense it looked like they would be before the season, but they are still 6-2, and were the first team to stop the Kansas City Chiefs. Pittsburgh’s schedule is slated to get a lot easier down the stretch so we may see them look a lot closer to that potential than they have so far, especially with the continued strong play of WR Antonio Brown. The Ravens, like the Steelers, are slated to see their schedule get a lot easier down the stretch, and they may need that to content for a wild card spot as the season wears on. 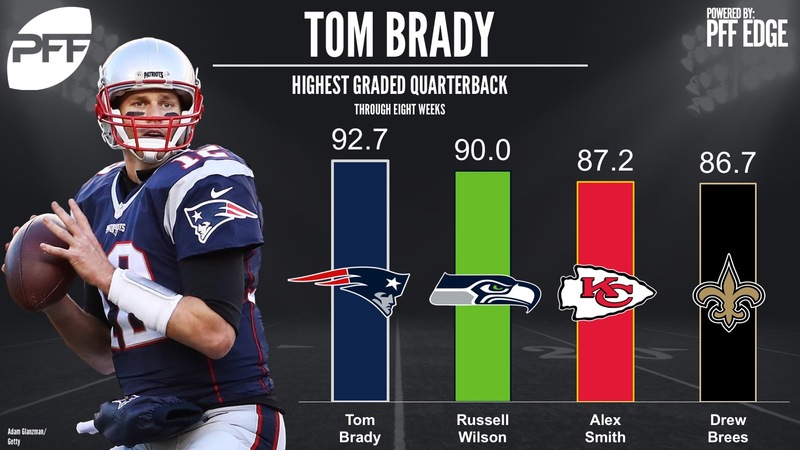 QB Joe Flacco is currently the 29th-ranked QB in overall PFF grade with a mark of 69.5. The Bengals are going to have to contend with one of the league’s toughest strengths of schedule going into the back end of the season, and they haven’t been able to top .500 with a far easier slate of games thus far. Cincinnati’s offense has been much improved after changes to the scheme earlier in the season, and they will need it to be in the second half of the year. The Browns are currently 1-of-2 winless teams, and they’ve achieved that despite a schedule that has been middle of the pack in terms of difficulty. In the second half of the season that schedule is looking significantly tougher, and is going to make it hard to find wins. Rookie QB DeShone Kizer is the lowest-graded QB at PFF, and has been a major problem for the offense. The Chiefs were the NFL’s last undefeated team, but have wobbled since that point, with back-to-back defeats before righting the ship with a win this past week. They still look like one of the better teams in the league, and their strength of schedule gets significantly more beneficial to them over the remainder of the season. 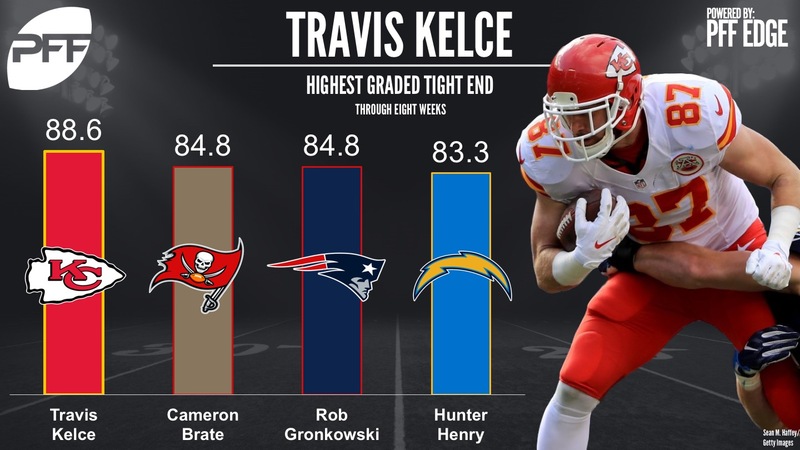 They’ll hope to get more performance out of TE Travis Kelce like they got on Monday night, as he is now the league’s highest graded tight end. Denver’s defense has been as good as ever this season, and actually been dramatically better than it looked on paper heading into the season. Their quarterback situation though has fallen apart, with Trevor Siemian regressing badly from an already ugly start. Their schedule at least remains relatively easy for the remainder of the season. As always seems to be the case, the Chargers have been hammered by injuries this season which has put them behind the chains this season, and though their schedule has been manageable and is only getting better down the stretch, there are still too many flaws in this roster for them to be contending long-term. There may not be a more disappointing side in the league than the Oakland Raiders through the first half of the season. One of the preseason favorites currently sit at 3-5, and the projections don’t see them improving this much down the stretch. Khalil Mack continues to dominate, but there isn’t enough help around him. The Eagles have been arguably the league’s best team over the first half of the season, and the analytics projects them to be right there at the end of the year too. 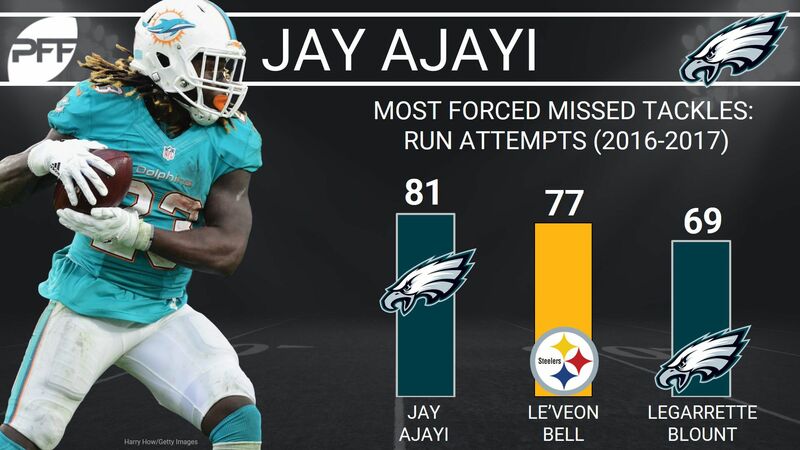 The big question mark is that they have had one of the easiest schedules in the league to date, and that is going to get marginally harder over the second half of the season, but they have bolstered their weaponry with the addition of former Dolphins RB Jay Ajayi. The Cowboys have had some impressive play, but they have just managed to stay above .500 thanks to their last week’s win over Washington. With a schedule that’s going to get tougher down the stretch, things are going to be harder over the final half of the season, and Ezekiel Elliott’s suspension is the great unknown in this projection. Washington has been struggling through the season and has a losing record thanks to dropping a game against the Cowboys this past week. They have had a relatively easy schedule, which gets marginally tougher down the stretch, but is still among the easier half of the league’s, so this is a team that needs to pull out some wins. The Giants have just one win through the first seven games of the season, but the analytics actually likes a lot of their play, from their powerful secondary to the improved play of QB Eli Manning. With one of the easiest schedules in the league over the final eight games, the projection is for the Giants to go on something of a run of wins. No team is staring into a tougher strength of schedule than the Carolina Panthers over the second half of the year. They have been up and down, largely with the performance of Cam Newton at quarterback, and they have the toughest run in of any team in the league, but the analytics is backing them to come through it and take the division. The Falcons have struggled so far this season, at least in the context of being a Super Bowl team a season ago, and one play away from being league champions. They still have a winning record, and they have done so with one of the league’s tougher schedules, which doesn’t get any easier down the stretch. The NFC South is a close and hard-fought division, with the top three teams all in contention to take it by the end of the year. The Saints currently lead the division with a 5-2 record, and their schedule does get easier down the stretch, but the analytics doesn’t quite buy into their current performances, and has them as a weaker team than both the PAnthers and Falcons with the division still to settle things amongst themselves. The Saints could drop a lot of games quickly if they prove to be weaker than those division rivals. The Bucs have been one of the league’s most disappointing teams so far given what was expected from them, and their schedule is slated to become the second-toughest in the NFL down the stretch. The Bucs only have two wins so far, and it’s going to get tougher to find them over the second half of the year. The Vikings have been able to get to 6-2, leading the NFC North, despite missing their starting quarterback Sam Bradford for most of the season and losing their star rookie Dalvin Cook to a knee injury earlier in the season too. They have also had the league’s fourth-toughest strength of schedule so far, and that eases off a little down the stretch. 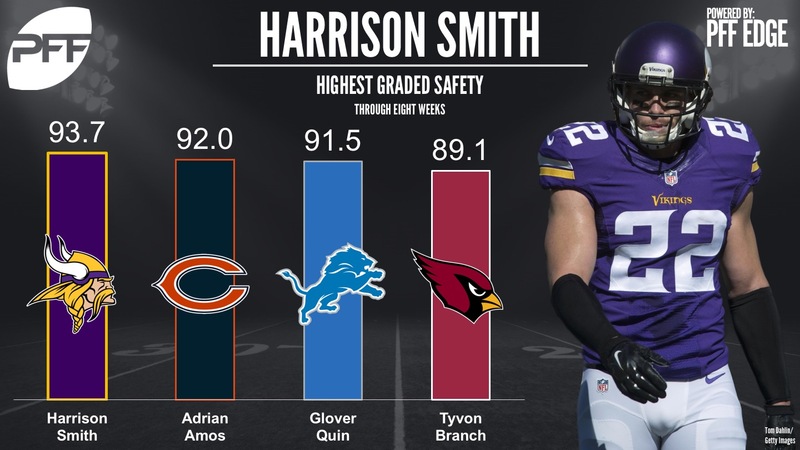 With one of the best defenses in football led by the league’s highest graded safety in Harrison Smith, this is a contending team, but quarterback is a huge question mark. The Green Bay Packers have to contend without their star quarterback Aaron Rodgers, but their schedule does at least get marginally easier over the second half of the season. They have had some impressive individual performances, but there is no replacing Rodgers for what impact he can have on games. The Bears could be one of the surprise teams over the second half of the season. They have made a switch at quarterback going to rookie Mitchell Trubisky, and they have one of the league’s toughest defenses. What may really help though is that to date they have had the league’s toughest schedule, but that becomes significantly easier from this point onwards. It seems to be a trend that the analytics just do not like the Detroit Lions at the moment. When they win, they eek it out and don’t do it convincingly enough to get much credit, but when the wheels fall off it looks ugly. They are a three-win team right now, and with one of the league’s tougher schedules again, it doesn’t look likely to improve dramatically over the second half. 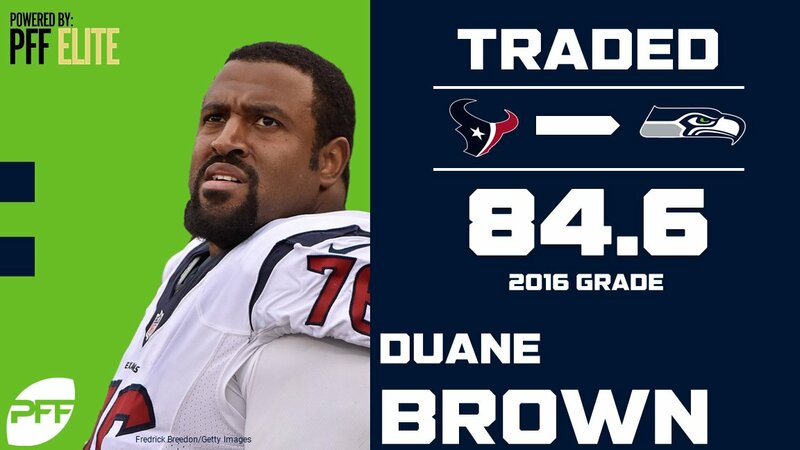 Seattle’s strength of schedule isn’t going to change down the stretch, but the strength of their offensive line should with a massive potential upgrade coming at left tackle in the shape of former-Texan Duane Brown. Over the past two seasons the Seahawks have had the league’s worst left tackle, so if Brown is even average he should make life much easier for QB Russell Wilson. No team has had an easier schedule through the first half of the season than the Rams, who have taken advantage of that to rack up five wins and are separated from the Seahawks at the top of the division only by tie breakers. Over the second half of the season that schedule does get tougher, but is still among the easier in the league, so getting to double-digit wins and playing January football is a very realistic target for this team. Arizona’s season realistically went in the tank the second RB David Johnson went down, but they have still flirted with .500 over the first half of the season. Their schedule has been among the easiest in the league so far, and while it does get marginally harder over the second half of the season, it is still a very winnable group of games. The other winless team in the NFL so far, the good news for 49ers fans is that the analytics suggests that sooner or later they are going to get some return out of these close finishes they keep being a part of. Trading for Jimmy Garoppolo has the potential to really impact the bottom line, as he looks a significant upgrade over rookie C.J. Beathard.